Election day is five months away, but Tom Wolf is already taking over the mantle as head of his party. The battle for leadership of the party has become an early test of the gubernatorial nominee’s clout. Wolf is lobbying hard to make Katie McGinty – his former rival for the gubernatorial nomination – chairwoman of the PA Democratic Party. He is doing so over the objection of sitting Chairman Jim Burn, who is seeking a second term. Democratic State Committee members will meet to vote for their leader next weekend in Camp Hill. 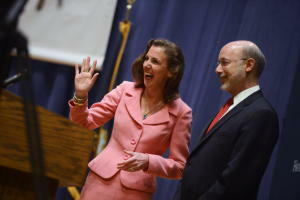 McGinty, a former DEP Secretary, officially announced her candidacy on Wednesday. Wolf’s campaign emailed committee members advocating for McGinty for Chair and State Rep. Jake Wheatley of Pittsburgh for Vice Chair. Behind the scenes, Wolf and his team are working the phones. Burn has refused to step down and has asked committee members for their support. He declined Wolf’s request that he step down. Burn’s record includes a broad sweep of statewide election contests as well as a party apparatus that has dogged Gov. Tom Corbett – and his approval ratings – effectively at nearly every turn since January 2011. But some in the party have also complained about the chairman’s fundraising performance. History is on Wolf’s side – and McGinty’s. That’s because the party typically defers to gubernatorial candidates on their choice for party head, explained Pam Janvey, the PA Democratic Party Recording Secretary. Janvey supports McGinty but holds no ill will towards Burn. It’s a common sentiment, based on conversations with nearly a dozen committee members and Democratic campaign operatives. Bucks County Democratic Chairman John Cordisco, for instance, is supportive of Burn – yet also wants to prevent a divisive battle. Cordisco said McGinty had reached out to him by phone on Thursday. 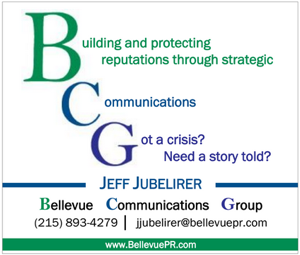 He emphasized that he wanted to reach out to his fellow southeastern PA county chairs but ultimately was hoping that everything could be settled before the committee meeting. McGinty spokesman Mike Mikus was optimistic about his candidate’s chances. Meanwhile, Wolf’s campaign has been intensely gathering support for McGinty. Given the size of Wolf’s victory and the desire of Democrats to stay united in the campaign, it’s expected that heavy pressure will be brought on Burn to step aside before any voting occurs. Neither Burn nor Wolf’s campaign responded to requests for comment. Beyond the contest for party chair, the situation underscores a gap between Tom Wolf’s public persona and his inside game. Despite the campaign ads that cast him as an outsider, Wolf and his team are very familiar with the state committee process. Wolf’s top campaign adviser is Mary Isenhour, who served as the party’s Executive Director under Governor Ed Rendell. McGinty’s top campaign adviser was TJ Rooney, who served as party chairman under Rendell. Burn, an attorney and Allegheny County Councilman, took Rooney’s spot after the 2010 primary. Gubernatorial nominee Dan Onorato initially intended to support York Mayor Kim Bracey for the spot, but Burn, with the backing of U.S. Senate hopeful Joe Sestak, convinced Onorato not to. Wolf is undertaking an effort to bring the Democratic insider forces together. Being a former member, along with McGinty, of the Rendell cabinet as well as a long-time party donor, Wolf is no stranger to the Democratic committee. Still it’s imperative that he succeeds at the party’s state committee meeting next weekend without looking like a party boss (despite the obvious fact that he now is the party’s boss). Ultimately, the goal for Tom Wolf is to come out of these next few days stronger than he entered them. If he does, he moves one step closer to the Governor’s Mansion, if he doesn’t he gives Tom Corbett a real opening. “I visited all 67 counties” is what candidates say when they don’t have anything else to run on. Burn originally ran as Onorato’s pick and got others out of the race to promote party unity, so it’s funny that he’s changing his tune now that that he’s not the candidate’s pick. I don’t have anything against Burn. He did an ok job as chair, but never lived up to his potential or all he promised for the party. It was the same as when he was Allegheny County chair. He was supposed to be a progressive chair that would invigorate the party, but he was mediocre and never really accomplished anything. He wasn’t terrible, just not as great as he claims to be. It’s time for someone new, and if Wolf wants McGinty, she has my vote. I urge all to file a complaint with theFEC objecting to Rendells appearances on comcast and demanding equal time for other dems and non dems. Call this what you will but this tactic by Wolf STINKs- many voted for him because we thought he was better. This tactic stinks and reflects heWolf is just another slime ball politico. Repeat this-McGinty is a Loser! This tactic by Wolf and Rendell is a power grab and does us all a disservice. Burns has earned reelection- no denying that. McGinty is a loser unappealing ,to men and women except her friend Gore who sold his soul to Al Jazerre..if we haven’t put the dem party up for sale too- reject MCGinty- she doesn’t deserve to lead our Party. 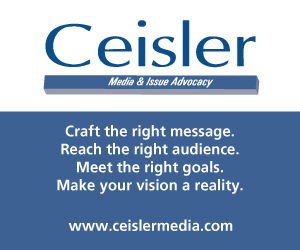 Wolf’s victory over Corbett is assured, even if Bob Asher himself were elected Dem chairman. State committee doesn’t have the resources to make a difference in the Gov race, either way. All the state committee can do is direct/coordinate resources to improve a few swing races in the legislature, that that Wolf has as many Dems as he can get helping him with legislation. If state committee could turn Wolf’s 20-point victory into a 22-point victory, they should expend those resources on legislative races instead. Tie the Dems to Wolf and their GOP opponents to Corbett. Jake Wheatley energetic and exciting? How is Wolf “forcing” his choice on you? Have you been kidnapped and tied-up, and are typing here with your nose? McGinty has as much right to run for Chair as any of the other 3.5 million Dems in the state. You could put your name out there as well. So could I (which would be a hoot for about 5 minutes). Until Saturday the 21st, no one has been nominated, and no one’s nomination has been seconded. Katie can run. Wolf can voice his support. If you don’t like Katie, then vote for Jim. Or nominate your own preference. You have input: You get one vote (just like everyone else). If you go to the Friday night parties, you can mingle, wear a button, and encourage your fellow committee people to vote for your preference. But, let’s stop all the whining that Wolf has committed some unpardonable sin for the audacity of announcing/supporting a candidate for Chair that he prefers. This is nothing but a power grab by Rendell and his cronies. It is a move to put in place hacks that will continue to feed his favorite consultants while simultaneously teeing up Katie to run for Senate in 2016. The worst part of it all is that our future governor probably cannot see the ways he is going to be used by Fast Eddie for at least the next four years. If state committee is ok with this grand Rendell master plan, then it should proceed as Wolf says he wants. But, if they think this is something that is really in the best interest of the Party, they are crazy. Katie’s performance in the primary was not the least bit remarkable. The only thing that was memorable about her was the atrocious Philly accent she would suddenly turn on when she thought it would help. Tom Wolf absolutely DOES NOT “deserve” or “have a right” to name his own chair. That is State Committee’s decision under the Bylaws of the PA Democratic Party. All Tom Wolf is owed is our support for the General Election in November — NOTHING MORE. If Tom Wolf forces his choice on us, I will stop coming to most of the meetings and so will a lot of other people — it’s expensive to come and why spend our money for a dead end meeting where we have no real input? Why not just let His Royal Highness King Tom Wolf (and Emperor Ed Rendell, in pulling the strings in the background) make the decisions? But I think Burn will win — I don’t know one person who is foolish enough to vote McGinty. Who is going to take over the party when she pulls out to gear up for a US Senate run in a year or so? Wheatley? UGH. You make a good point. Those interested in improving the party would be better off with my input. Those interested in merely furthering their own power/money have little use for my ideas, since I run counter to their ambitions. Fortunately, friend and foe alike read my suggestions here, and take my advice, or be entertained by the battles. Enough with the attacks on Burn and McGinty. I don’t know why people are attacking Mike Mikus. He’s a solid campaign operative and has won some of the toughest races this state has had over the past few years – Altmire, Critz (twice in 2010), and Fitzgerald. Besides, he’s not on the ballot. Is he perfect? No, but who is. Jim Burn has done a pretty good job. Katie would be good as well. It’s fine to have a debate over who is best, but why tear down other Democrats? Nobody knew who the hell Jim Burns was ( and only slightly more know now) and his previous election was an old fashioned back room deal which is ok.
We are not electing the Pope or the head of facility of Penn Medical School so – if Mr. Wolf thinks the party needs to change its Party Chair ok -lets give it a spin what can it hurt. Both candidates can be good capable people and still change can be constructive and not arouse all the bog trolls and childish vituperation. I respect Jim but am voting for Katie. Wolf is the candidate and deserves his person at the helm. I would like to see Jim as Vice Chair. The accolades paid to Jim for 2012 are fine but we need to look at 2010. The Ds got trounced. Fact is Rendell’s group did a hell of a lot better as getting out the vote in the both gov races and the municipal off year elections. We need a boots on the ground organization and that was lacking in 2010. If Jim wants to stay he needs to tell the committee what is going to be different with this campaign. and that he would accept vice chair. I don’t know why they would vote on this. All that matters is what David Diano thinks. Just ask him who to go with. In fact, that should be how all policy is made in Pennsylvania. McGinty finished 4th. There were 8 or 9 candidates who ran initially. If Wolf had Katie’s budget or if she had his budget, this would be a different conversation. For a new comer, in a crowded field of well funded candidates, Katie acquitted herself well. She didn’t fall to desperation and make ridiculous attacks on the other candidates. She stuck to the issues and she came out with a lot more respect than McCord and Schwartz, who covered themselves with inglory. The committee votes to elect the chair. Jim and Katie will each have supporters. But, Wolf is the big “dog”. Ed Rendell deserves the right to have his own person running state committee again. This is a smart move to put a woman out as the face of the party, particularly a woman with McGinty’s image. Burns has the charisma of a damp rag. The wolf man is howling now because the moon is full. Philadelphia rules, baby! David- I respect your point of vie but you choose to ignore thatMcGinty finished last for a reason- she is not very appealing to many men and women who find others more qualified. Jim Burns has earned re-election. Wolf doesn’t own the Party- unless he wins a general election. No deference till then.burns deserves re-election – McGinty doesn’t deserve to lead PA dems! Democrats should favor DEMOCRACY And let the elected state committee members decide as opposed to a kingmaker scenario. It would be hypocritical to do otherwise. Mcginty, Mikus… NO FRACKING way!!!! I agree that Jim has been great on everything you mention on the public front. Jim has been a great spokesperson for the Democratic party. He was far better than the “national” Dems in interviews on Hardball. I think he has been ill-served by those whose advise him. There’s stuff I’ve told him that he should have heard long before I got the chance to mention it. If Jim winds up remaining chairman, he should expand the range of people he’s getting information from. As for Katie, I like her. She brings a lot of energy and I’d expect her to be very hands-on. She has a great grasp of the issues, and during the debates, she was laser-focused on attacking Corbett, rather than the other candidates. So, I think, if she’s selected, she would continue Jim’s excellent attacks on Corbett. But, traditionally, the State committee pays deference to the Gov candidate, and the relative merits of the chairman candidates are less relevant than respecting the choice of Wolf. Agree that McGinty is a loser-she appeals to few men and women. Burns earned reelection- has wolf bought this Party? Poor judgment by Wolf- Send McGinty to Tenn. so she can work with her buddy Gore – we need centrists to lead not left wing losers! Jim Burn has been an outstanding Chair and deserves four more years. He kept his commitment to encourage open debate at state committee meetings, to help party build in all counties, and to visit all counties to gain understanding of the needs and goals of our local committees. Jim knows that to win statewide in 2014 you need to close the margins in the T and that is why he has devoted time over the last four years to visit and support all county committees. Under Jim’s leadership the PA Democratic Party has been active in defining Corbett and letting the public know the real Corbett record. Jim’s leadership was instrumental in helping the Dems win five of five statewide races in 2012. For all of these reasons and many more Jim Burn should be re-elected on June 21. There’s a better chance of her winning than of a coward like you having the balls to come out of the shadows. McGinty is a LOSER.wolf doesn’t own our Party- or was it on sale?burns deserves reelection and if this disgraceful tactic is sanctioned next week- we should consider Corbett. The poor judgment and hypocrisy displayed by wolf undercuts his campaign. Did Eric Cantor change his name to Tom Wolf? Arrogance is no substitute for leadership! This would be fantastic news for the natural gas industry if McGinty and Mikus were able to prevail given all of her energy firm donations as well as his record working for EIS Solutions, the fracking “astro turf” firm. I believe these are very poor selections. Jim Burns has done an outstanding job over the last 4 years. He is responsible for the lead that Wolf has over Corbett. It is sad that Wolf doesn’t respect that. I now hope Corbett wins. David Diano, can you tell us what you think McGinty’s chances are? Please let us know two ways: first, with a light-up name tag, then without a light-up name tag. My guess is that her chances are better without the name tag, but I don’t have the political expertise on the issue that you do. Jim Burn has been preaching the mantra of defeating Corbett for months. He, as much as anyone, tried to keep the candidates from going after each other in the primary and focus on winning in the fall. Ironic that “Wolf” is now throwing under the bus the guy who protected him from most attacks in the primary. We know the Rs will have no such restraint. You quote Mike Mikus – the same Mike Mikus who led the losing campaigns of Mark Critz and Katie McGinty. Just wondering if he’s trying out for a job as Executive Director. Those calls yesterday were all about counting – I’m guessing that the Wolf/McGinty camp weren’t getting the response they wanted because I don’t know one State Committee person who wants this fight. Most I know have told Mikus – Wolf/McGinty should back off – because if this comes to a vote they are with Burn. Jim Burn has done his job as State Chair. Dems should thank him for his service. But that is all he is owed. It is disingenuous to state that he was not the choice of Dan Onorato given the prior relationship between the two. The facade now being constructed of him as a grass roots choice is ludicrous – he is and was the ultimate insider and favorite of Party Boss Bob Brady. I have no personal issue with Jim, but the packaging being sold by his handlers is that the Dem Party did not start until after November 2010 (Jim is not taking any blame for the November 2010 disaster and ignores the 2013 failure to defend his endorsement and then beat a very beatable superior court candidate)- is self-serving and unbecoming of Jim as a person. Jim’s taking credit for the sweep of 2012 is just wrong – 2012 was a Presidential year, Bob Casey was on the ballot, Jim did not support Kathleen Kane in the Primary, we had the superior candidates vis a vis the GOP, and Governor Corbett’s unpopularity was high. as hard as it may be for Jim and his supporters to accept, his clips on Hard Ball did not win the state for Obama and Casey or result in the sweep of state row offices. Nor will Jim’s position at the helm determine victory going forward. To ensure the 2014 historical victory, Dems need to enable Tom Wolf to present the image he wants his campaign to project and ensure coordination of his message throughout the state, and have the team he wants and needs. If Jim Burn is such a stalwart of the Party, he would urge his supporters to unify around the ticket of McGinty/Wheatley and give Wolf/Stack the team they want. That is all.